With two dining options from the Modera Collection, this collection can fill any sized space in any type of home. For a large dining room in a single family home or large suburban townhouse, opt for the Rectangular Dining Table. This handsome, dark brown table measures 68" long and includes an additional 18 inch leaf so you can entertain any size group. For an apartment, condo, or urban style townhome, opt for the Square Cafe Table. This table features the perfect combination of materials with a wood base and glass table top, for a contemporary feel. Gather family and friends at this table with the Cafe Parsons Chairs, six can fit comfortably at this table! Even Modera's dining storage is sleek, elegant, and modern! 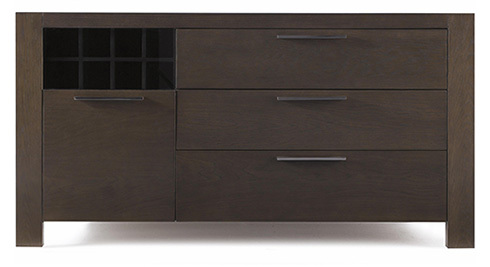 The Dining Server features four drawers and a wine rack, designed in a unique configuration. Thick block legs match the dining table options from this collection and the sleek drawer hardware fit a modern or contemporary decor. To view the Modera Dining Collection in full or other modern dining room furniture, visit Belfort Furniture! With four showrooms in one convenient location, Belfort offers over 100,000 square feet of showroom space with hundreds of room settings to inspire you. Shop Online at BelfortFurniture.com or in-store at our Dulles, Virginia location.